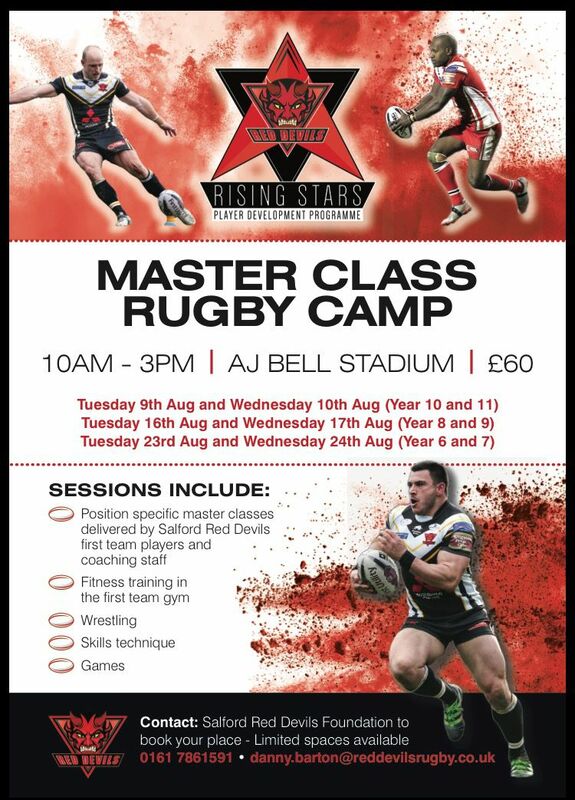 The Salford Red Devils Foundation are hosting a series of master-class training camps for under 11’s to under 16’s boys at the AJ Bell Stadium in August. The sessions will give the participants the opportunity to benefit from the expertise of the clubs professional coaches, as well as take part in position specific sessions lead by the Red Devils first team players. Participants will also have access to the AJ Bells first class facilities, with specialist lead sessions taking place in the club gym. These camps are part of the Foundations development programme which recently received the highest possible mark in its RFL appraisal. Places for these camps are expected to fill up quickly so participants are encouraged to reserve their place ASAP.